You are here: Home / Wild Blog / Whales and Dolphins / World class whale watching? Head for Ireland! This thrilling encounter with a breaching humpback whale on the West Cork coast was the highlight of a fantastic day of guided wildlife watching. I’d had a fantastic day watching all manner of wildlife along the West Cork Coast with guests on one of our custom Discover Wildlife Tours recently. From basking sharks to choughs and jays, wildflowers and butterflies to common dolphins, minke whales, and much more besides… by any measure it had been an exciting day. We were finishing up the tour on Toe Head, a fabulous coastal vantage point along the West Cork stretch of Ireland’s Wild Atlantic Way, enjoying the spectacle of hundreds of common dolphins passing a rock formation known as The Stags. Out of the corner of my eye I caught an almighty splash in the middle distance. Swinging the scope around for a closer look I expected to pick up a breaching basking shark, or perhaps a minke whale, but as the image snapped into focus I could clearly see the unmistakable fluke of a humpback whale slapping the water’s surface. One of hundreds of common dolphins we encountered on the trip. There were two humpbacks, and over the course of about 30 minutes they treated us to views of lob-tailing, flipper slapping, breaching and fluking through the scopes before they slipped further offshore and out of our range. By then it was time to finish up — but my humpback adventure was just beginning. I made a beeline for Reen Pier, near Union Hall, where I joined the Irish Whale and Dolphin Group (IWDG) and Cork Whale Watch on a hastily arranged excursion to get vital Photo ID shots of the underside of the humpback’s flukes. These photo ID shots allow researchers to identify individual animals and may one day help unravel the mystery of where these enigmatic giants go when they leave our shores. As we approached the area where I’d originally picked up the whales the sea was thick with dolphins, basking sharks and minkes, but initially there was no sign of the humpbacks. 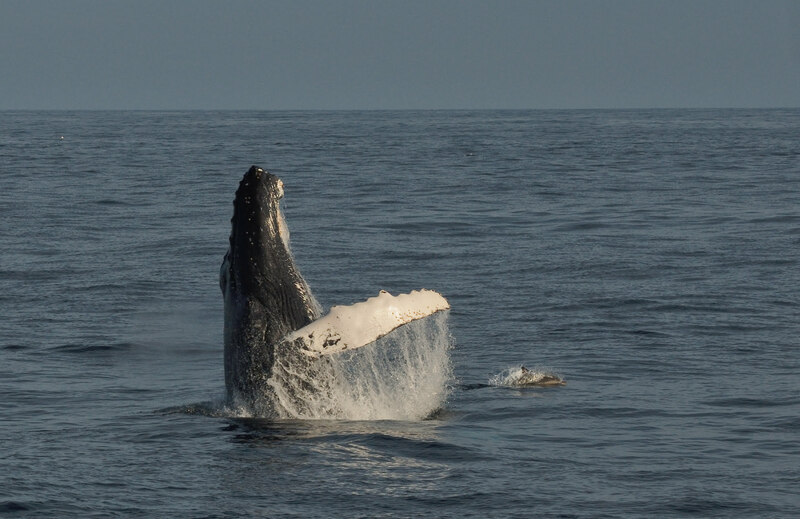 We headed offshore, and sure enough soon picked up activity on the horizon — huge splashes that as we got closer resolved themselves into a breaching humpback whale. It’s an extraordinary experience to witness a 35 tonne leviathan launch itself clear of the water, and this one appeared to be in a jumping mood, as it continued to breach dozens of times as we approached, as well as exhibiting a range of other behaviour. We clinched the required fluke shot, and got some spectacular breaching photos. The gallery below offers a sample of what we saw, but photographs can never truly do the experience justice. A breaching humpback whale alongside a surfacing common dolphin off the West Cork coast. The extraordinary thing is that this is far from an isolated incident. The marine wildlife around Ireland’s south coast at the moment is spectacular, and encounters with basking sharks, dolphins, minke whales an humpbacks have been a regular occurrence over recent weeks. Just check out this video of a humpback spy-hopping right next to the Cork Whale Watch vessel The Holly Jo (shared on the Cork Whale Watch Facebook page) this week. And here’s another recent video showing a breaching humpback. I was watching more humpback whales, breaching basking sharks, minke whales, common dolphins and harbour porpoises from the cliffs on Cape Clear Island over the weekend as part of Bioblitz 2016. 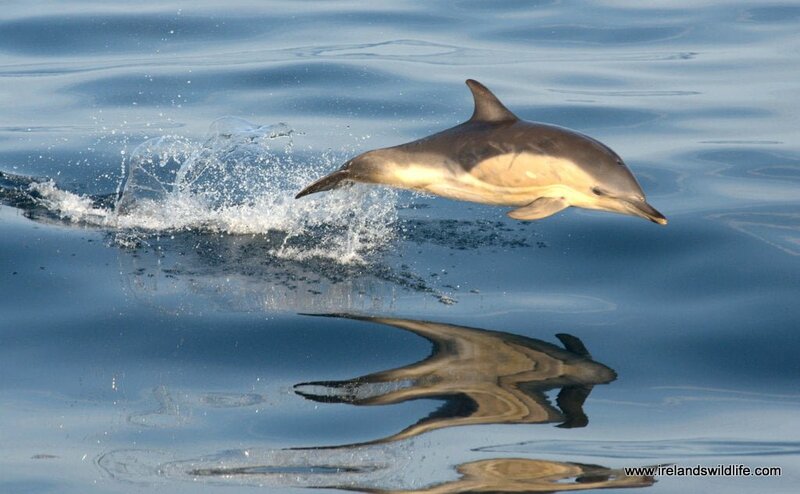 Marine wildlife watching off Ireland’s South coast at the moment is truly world class. If you have the opportunity, don’t hesitate. This really is as good as marine wildlife gets… anywhere!